My customers use it to do shift planning and make those off-weekly-work-profiles work (like someone having half day two days a week, but not the same days next week and free every third Friday after a full moon and such). To set this up you need to add a color to you profile. Check out my post on profile configuration for more information on that. You can filter based on calculation group and/or approval group. The Display options are layered and shows the profiles in the way the profile calendar is querried from the Time Journal creation. You can activate them at will by clicking the check boxes. 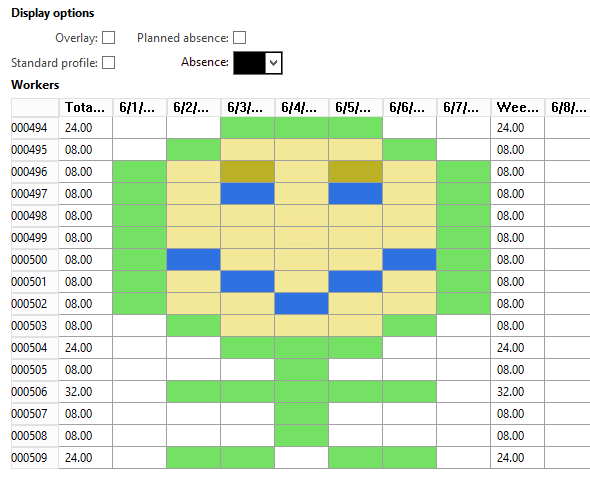 “Overlay” will show the profile group and all, Standard profile is the default profile on the workers employee settings and then you have “planned absence”. 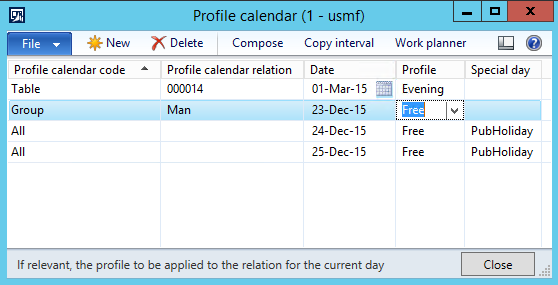 The profile calendar is used to make planned changes to the default profile that is used for calculation. When doing the profile calculation the system checks the Profile calendar to override the default profile and this is loaded as the profile for that journal. 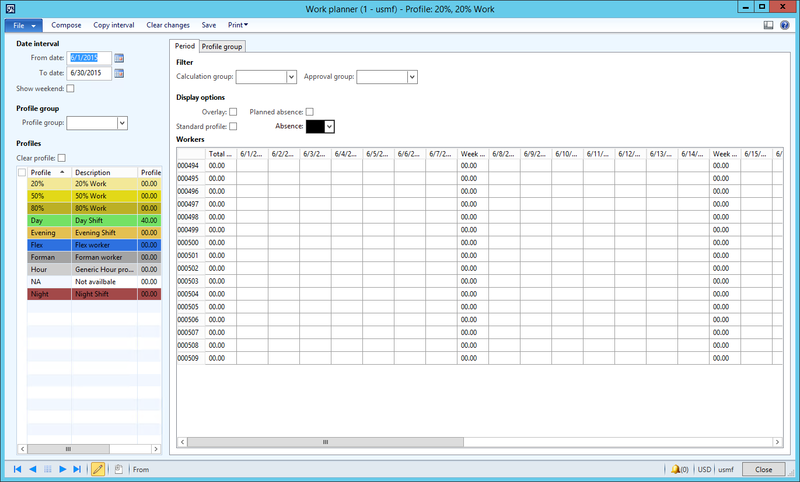 So you can predetermin the profile that the user is going to have at calculation by creating a record in the profile calendar table. You can set this up for special work days that deviate from the standard work hours, but it is also a very nice tool to handle complex profiles where the profile changes from week to week. Go to Human Resources > Setup > Time and Attendance > Time Profiles > Profile Calendar to add new records. You can do changes for entire profile groups or for all workers as well by changing the Profile calendar code collumn to Group or All. Use special day collumn to trgger the special day in the pay agreement. For instance if a Monday is Christmas Day and if someone comes in and does work, they will get the special day pay instead of a simple Monday. There is a great graphical tool for handling profile calendar which is called job planner. I will look into that later.